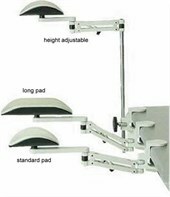 Provides the answer for those who require support for their forearm when eating, typing, or working at a table. Has enabled many people to work again. Reduces fatigue and strain and improves arm mobility and dexterity. Suitable for keyboard operation and a wide range of other activities, both at work and leisure. Quality of manufacture and finish is a major feature. Neat and attractive design, would not look out of place in any home, office, or school. Clamps easily to edge of a table or desk. Arm length: standard 89mm arm models. Clamp size: 15-43mm or 34-64mm. 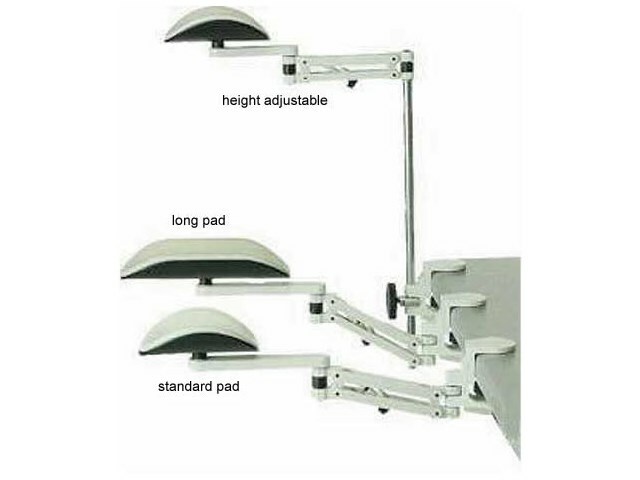 Height adjustable (ht adj): brings the lower pivot point above the height of the table, therefore increasing reach over the table; also comes with 100mm & 200mm height extension bars. Height may be adjusted quickly and easily. See also: Ergo Rest - Long Arm.